The DNP Select Income Fund Inc. (NYSE: DNP) is a diversified, closed-end management investment company that first offered its common stock to the public in January 1987. The Fund's primary investment objectives are current income and long-term growth of income. Capital appreciation is a secondary objective. DNP has outstanding Floating Rate Mandatory Redeemable Preferred Shares (MRPS), secured borrowings and secured notes to leverage the common stockholders' investment. The Fund seeks to achieve its investment objectives by investing primarily in a diversified portfolio of equity and fixed income securities of companies in the public utilities industry. The Fund's investment strategies have been developed to take advantage of the income and growth characteristics, and historical performances of securities of companies in the public utilities industry. Under normal conditions, more than 65% of the Fund's total assets will be invested in securities of public utility companies engaged in the production, transmission or distribution of electric energy, gas or telephone services. The Fund may invest in the securities of domestic and foreign issuers as well as in securities of companies of any market capitalization, including small and mid cap common and preferred stocks. The Fund may not invest more than 25% of its total assets (valued at the time of investment) in securities of companies engaged principally in any one industry other than the public utilities industry, nor have more than 20% invested in foreign issuers. The Fund will purchase a fixed income security only if, at the time of purchase, it is rated investment grade by at least two nationally recognized statistical rating organizations. These letters show the character of distributions paid by your Fund on its common stock for the calendar years shown. The letters should assist you in the preparation of your federal and state income tax returns. The Fund is qualified as a “regulated investment company” as defined in the applicable provisions of the Internal Revenue Code of 1986. If the investment income dividends you received from the Fund are subject to Federal and/or state income tax, those dividends will be taxed as ordinary dividends whether received in cash or reinvested in stock. The percentage of each investment income dividend that is qualified dividend income is contained in the letters. The percentage of each investment income dividend that qualifies for the dividends received deduction allowed to certain corporate shareholders is contained in the letters. Return of capital is a nontaxable transaction. Your cost basis must be reduced by this amount until the basis of your stock has been reduced to zero. Any excess is treated as gain from the sale of shares. Please consult your tax adviser regarding the proper treatment of this transaction. Answers to many of your shareholder questions and requests for forms are available by visiting Computershare's Website at: www.computershare.com/investor. Proxy voting disclosure and guidelines for DNP Select Income Fund are available at the following third party web address. Search or browse voting activity by company name, ticker, or meeting date. The board of directors has adopted the following procedures for shareholders to send communications to the board of directors. Shareholders may mail written communications to the full board, to committees of the board or to specified individual directors in care of the Secretary of the Fund, 200 S. Wacker Drive, Suite 500, Chicago, IL 60606. All shareholder communications received by the Secretary will be forwarded promptly to the full board, the relevant board committee or the specified individual directors, as applicable, except that the Secretary may, in good faith, determine that a shareholder communication should not be so forwarded if it does not reasonably relate to the Fund or its operations, management, activities, policies, service providers, board, officers, shareholders or other matters relating to an investment in the Fund or is purely ministerial in nature. Equity Securities: The market price of equity securities may be adversely affected by financial market, industry, or issuer-specific events. A fund that focuses its investments in a particular industry or sector will be more sensitive to conditions that affect that industry or sector. Credit and Interest: Debt securities are subject to various risks, the most prominent of which are credit and interest rate risk. The issuer of a debt security may fail to make interest and/or principal payments. Values of debt securities may rise or fall in response to changes in interest rates, and this risk may be enhanced with longer term maturities. MLPs: Investments in Master Limited Partnerships (MLPs) may be adversely impacted by tax law changes, regulation, or factors affecting underlying assets. Connie Luecke serves as Senior Managing Director with a career that spans 30-plus years in investment management, research, and capital markets. 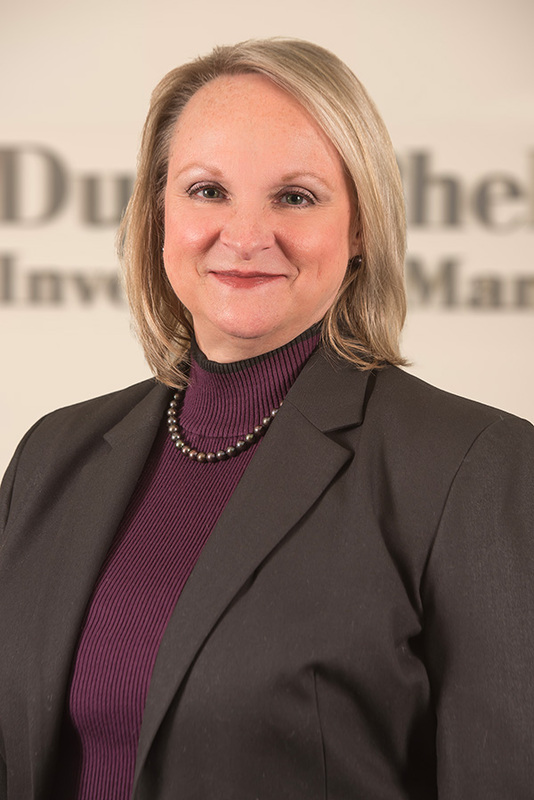 Ms. Luecke is the Senior Portfolio Manager for the firm’s Global Listed Infrastructure Strategies and serves as the Chief Investment Officer of the DNP Select Income Fund Inc. Ms. Luecke joined Duff & Phelps in 1992 and has held the roles of senior research analyst and portfolio manager. Her research was focused on the global telecommunications and transportation infrastructure industries. She holds a BS degree from DePaul University and an MBA from Loyola University of Chicago.